Hepi Krismas to you all! CAFÉ PACIFIC is on leave until mid-January. Monitor Pacific Scoop for updates. AUT Pacific Media Centre's Karen Abplanalp has won a rare double award for her article on New Zealand investment in a controversial gold and copper mine in Indonesian-ruled West Papua at the annual Ossies for student journalism in Australia. She has won both the Sally A. White Prize for Investigative Journalism and Best Feature (Print) Award. Her article, "Blood Money", developed out of an assignment in her postgraduate Asia-Pacific Journalism course at AUT University in New Zealand, was published as the lead feature in Metro magazine last December. Last month, she was also awarded New Zealand's Bruce Jesson Emerging Journalist Award for the investigative article. Abplanalp investigated the $1.3 million New Zealand Superannuation Fund (NZSF) "ethical" investment in the US-owned Freeport McMoRan mine at Grasberg in southern West Papua region, which has been at the heart of human rights allegations for several years. Late last year, a strike at the mine led to several killings by security forces. 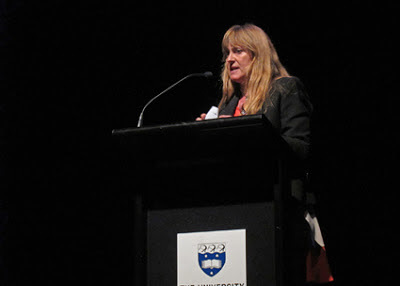 Judge Sharon Mascall-Dare in the Journalism Education Association of Australia (JEAA) Ossie awards investigative journalism category said: "Karen Abplanalp's investigation into human rights abuses at a copper and gold mine in West Papua is an outstanding piece of journalism. "Her methodology is robust; her presentation compelling. Her work was responsible for a national debate that, ultimately, persuaded the New Zealand Superannuation Fund to end its investment in the mine: her work held the fund's "ethical" investment policies to account. "Blood Money is exemplary in demonstrating investigative journalism as a medium for change, in the public interest." In the Best Feature (Print) category, judge Max Anderson, editor of Adelaide Hills Magazine, said Abplanalp’s article "demonstrates investigative savvy and a command of the feature writer’s art. "Incredibly assured and perfectly metered, it allows the facts and interviewees to do the hard lifting without confounding narrative or surrendering pace. Any editor serving educated readers would be delighted to receive it." The PMC's Alex Perrottet also won a highly commended award in the Best Use of Convergent Media for "Not eccentric at all", a combined slideshow, audio interview and text report providing an intimate glimpse of the life of King George Tupou V of Tonga before he died in March. This was published on Pacific Scoop website and posted on YouTube. 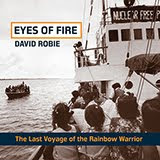 Judge Chris Campbell, director of Our World Today, said: "Engaging and personal choice of story - great interview." 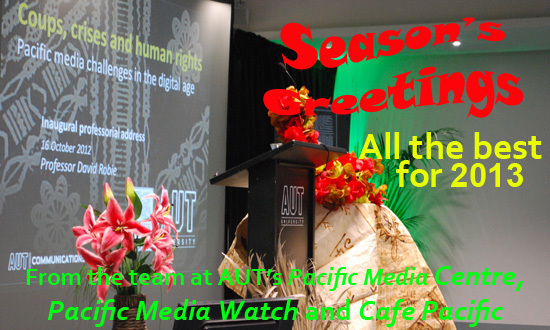 Perrottet has been the PMC's Pacific Media Watch media freedom project editor for the past two years. The winner in this category was Monash University's "highly professional" Dangerous Grounds investigative website probing environmental hazards and policies in the state of Victoria. Pacific Media Centre director Professor David Robie praised the centre's students for their contribution to investigative work. "It demonstrates the value of investigative research journalism when universities support their independent role," he said. 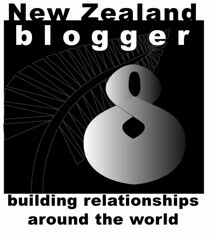 "Karen Abplanalp's article was recently republished as an example of research journalism in Pacific Journalism Review." The Best Publication category in the Ossies was won by the University of the South Pacific's Wansolwara newspaper. "This entry stood out because the journalists produced highly relevant and interesting stories in the public interest," said judge Paul Starick, head of news of Advertiser Newspapers in Adelaide. 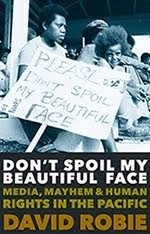 "The front-page expose on the rigging of the Miss World Fiji beauty pageant was a great example of investigative journalism, both in the research and writing." This report also won the Best News Story category. "Not only did the stories in this publication stand out from the crowd, the journalists worked under trying circumstances. Wansolwara [had been] subject to censorship under martial law. Yet it campaigned for press freedom in numerous articles - surely something that must test the courage of any journalist."